Impact 100 has always been about making a difference – both for the nonprofits to whom they offer grants, and among the Indianapolis community at large. Since 2013 Impact 100 has been making a difference in shaping the philanthropic perspectives of young women through its scholarship program, which covers the cost of membership for promising young philanthropists. Says Impact 100 co-founder Donna Oklak, “One young woman a year in the program was good, but ten plus women allows our organization and members to really felt the presence of these budding philanthropists as full participants in our committee work. Do you know a woman interested or just getting started in a career in philanthropy? Please encourage her to apply to Impact 100’s Scholarship Program. This program covers the cost of membership for those working to become tomorrow’s philanthropists. Scholarship recipients are encouraged to participate in all aspects of the Impact 100 process, including serving on a Focus Area Committee and voting at our Annual Dinner. Applications for the Scholarship Program are accepted during the last quarter of each year for a membership the following year. It is recommended that interested candidates review our website and blog postings to learn more about us our processes before filling out the Scholarship Application Form. Current applications are available on our home page as soon as they are released each fall until the application period ends. The form contains the deadline and other important information to ensure the applicant meets our requirements. Because receiving this scholarship requires a time commitment from the recipient, it is necessary for the applicant to complete and send in the form herself. Would you like to help us provide Scholarships to budding philanthropists? Donations to the Scholarship Program are accepted year-round. If you would like to make a donation of any size help these young women participate in our programs, please click here. 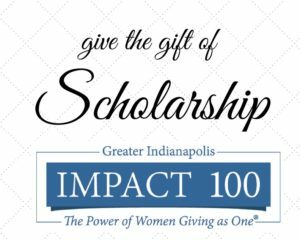 This entry was posted in Announcements, Scholarship on October 2, 2018 by Impact 100 Indy.